The women in Francesca Marciano’s globe-trotting new book of short stories are in search of transformation. They buy new clothes, remodel houses, look up ex-boyfriends, and travel to foreign countries as they attempt to change their lives. They don’t always know why they hunger for change. In the collection’s moving title story, “The Other Language,” a young Italian girl, Emma, feels compelled to learn English after her mother’s death. She hears “the clipped authoritative language” while on vacation with her newly-widowed father and bereft siblings and begins to spend all her time with two English boys in her effort to learn what she thinks of as “the other language.” When she finally speaks English it comes “like a flow, an instantaneous metamorphosis.” She experiences English as a means of escape: “She didn’t know what she was getting away from, but the other language was the boat she fled on.” Years later, as a naturalized American, Emma wonders how much the trajectory of her life is owed to a childish impulse. 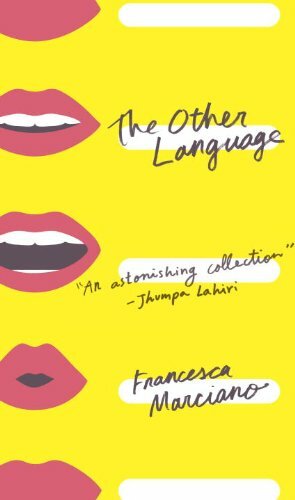 “The Other Language” may well be the most autobiographical story in this collection, because for Marciano, writing in English is a kind of freedom. She’s Italian, a screenwriter who writes for film and television in her native tongue, but for novels and short stories, she uses English. In a recent interview for Publisher’s Weekly, she said the practice began when she had trouble writing her first novel, Rules of the Wild. A friend suggested that she try writing it in English, a language Marciano knew well, and which made sense for Rules of the Wild, a story about English-speaking journalists living in Kenya. Three novels later, Marciano is still writing in English, and she’s still writing about foreigners living abroad. The Other Language is Marciano’s first collection of short fiction, and it was my introduction to her. A friend recommended the stories to me, and I fell for them immediately, parceling them out, one a day, to make the book last longer. Part of the appeal is the glamorous subject matter. Marciano has lived all over the world, and her stories encompass her experiences, taking place in Africa, the U.S, India, and of course, Italy. Her protagonists are usually women who are alone in some way, untethered from their domestic routines, if only temporarily. This collection often reminded me of Andrea Lee’s short story collection, Interesting Women — a title that could have worked for this book, too. Lee, who is around the same age as Marciano, also writes about women living abroad, and both women have a sensual, casually graceful prose style. But the strongest parallel between these two writers is autobiographical: their lives are, in a way, mirrors of one another. Lee is an American writer who has lived most of her adult life in Italy, while Marciano is an Italian writer who has lived her much of her life abroad, including a decade-long stint in the U.S.
She admired the ease Americans had with their bodies, how they used objects and moved around the furniture with a freedom Europeans never had. How they took their work to bed, ate take-out food in the car, how they put their bare feet on the table, walked inside a bank in their shorts, used their cars as a cluttered closet where they could toss in just about everything. To me, an American who has been smitten with Italian culture since a freshman-year screening of Fellini, images of messy cars, soiled take-out containers, baggy shorts, and the hot mess of freelancers and teenagers that is a New York City Starbucks only conjure up feelings of American self-loathing. But Marciano seems sincere in her appreciation of our American informality. At the same time, she’s well aware of the way Americans fetishize Italian style. In one of her funniest stories, “The Italian System,” an ex-pat Italian teacher decides to author a self-help book for Americans who want to live like Italians. The book, which sounds a bit like French Women Don’t Get Fat, educates Americans on the Italian way of life, one that embraces fresh ingredients, fresh air, wine, ritual, and above all, nonchalance: “Nonchalance is the key factor: the less you try, the easier it will be to feel as stylish and charismatic as the Italians are, deep down in their skin.” The irony is that the Italian teacher is writing the book at a time when she feels deeply vulnerable. After seven years in Manhattan, a place that initially made the Italian teacher feel “light, full of promise,” she feels lost, her ambitions stunted by her ex-pat status: “After all these years, [she] still felt self-conscious, afraid of making a faux pas.” She writes the book as a way of regaining confidence, and her tactic works — until she returns home for a visit. Back in Rome, she finds that her ritualized, traditional version of Italy is a product of her own nostalgia. Even her mother has embraced new customs, drinking Diet Coke with lunch instead of wine. In another story about wavering self-confidence, “Chanel,” a documentary filmmaker, Caterina, buys a Chanel dress she can’t afford while visiting Venice with her roommate Pascal, who is about to leave her to pursue a love affair in Paris. Caterina’s nature is pragmatic while Pascal’s is optimistic to the point of delusional, and she buys the dress as a way of emulating his free spirit. She plans to wear it to an awards ceremony, where she will receive a small prize for one of her films, but in an O. Henry-ish twist, she can’t wear the dress after all, and it hangs in her closet unworn for years. The dress, at first a symbol of hope and positive changes to come, becomes a reminder of missed chances and lost opportunities. Caterina grows to hate it, likening it to a corpse and “an old virgin — untouched but no longer fresh.” But Caterina cannot bring herself to get rid of it, and in the story’s final scene, the dress’s true value is revealed to her. Reading Marciano, I was reminded of an old writing teacher’s adage, “Bewilderment is the most human of emotions.” Marciano allows her characters their bewilderment, their curiosity, and above all, their vulnerability. The result is a collection of stories that is as entertaining as it is humane. Enduring the everyday is relatively straightforward -- just keep breathing and putting one foot in front of the other -- but how to transcend the everyday, in this world neither you nor I have made? Very curious to read these stories, love the quirky hooks, the unaffordable Chanel outfit, the Diet Coke-drinking mother back in Italy. What fun! Last summer I was lucky enough to attend a conversation between Francesca Marciano and Jhumpa Lahiri here in Rome. Marciano read “The Italian System” and then the two women began talking about writing in another language. Lahiri is now writing in Italian, and she said that writing in another language is like writing with your left hand. That the limitation is a daring. That in another language nothing you’ve done before matters. It’s a kind of starting from nothing.